If you can’t appreciate natural beauty then you must appreciate architectural marvels right? On the 4th of July, we decided to take in both in the same day! We started our morning by heading down to the Air force academy in Colorado Springs. I had never been on base before and wasn’t exactly sure what hoops we’d have to jump through to get through their checkpoints. It was a simple process and no cavity searches were performed so the day started off nicely. 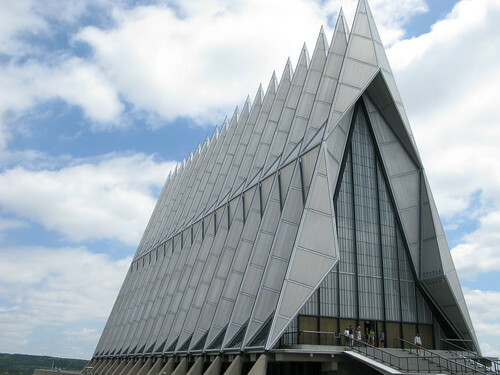 You can see the Cadet chapel from the highway, though the closer you get to it the more impressive it seems. The chapel stands in distinct contrast to the other buildings there. 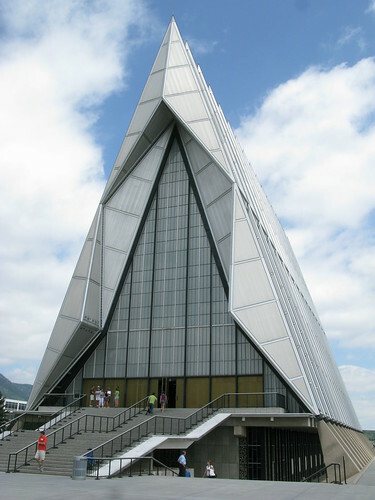 It has a very modern look with metal and glass standing in a sharp point aimed to the sky. 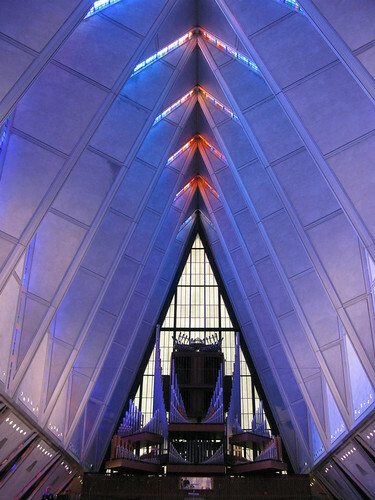 Melanie is here from Germany studying religion in America and wanted me to join her at one of her church experiences so I asked her to select an architectural masterpiece to visit and this is where we ended up. I am sure you can imagine that we looked maybe a smidge out of place with me looking around at all the architecture and the design and Melanie taking notes through the service. I suspect nobody noticed in the end however. We were able to check out the inside of the building as well however and it is pretty amazing. 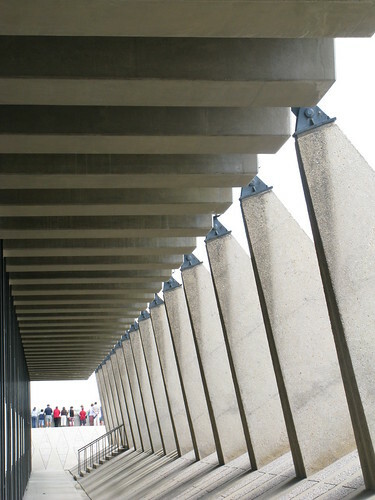 The background on the building is that it was built from 1959-1962 and designed by Walter Netsch. 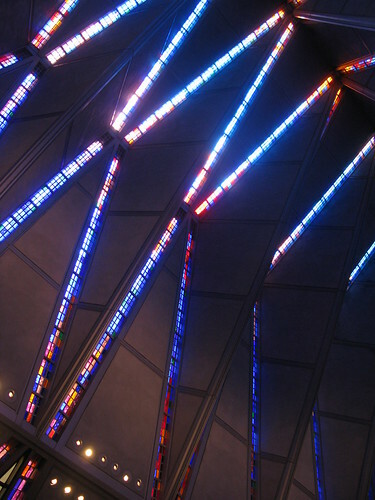 The chapel is constructed of tubular steel, aluminum panels and colored glass. 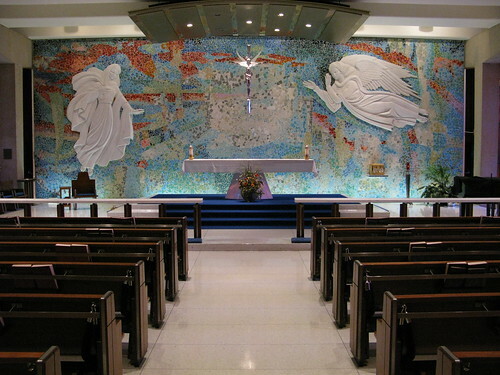 One of my favorite things is the pews in the protestant chapel, they were designed to resemble WW1 era propellers, both the ends of the pews as well as the seat backs to the pews. The Organ is also on full display in the upper chapel. I have to admit however the cross behind the alter had a lot of resemblance to a sword in my mind and I don’t know how I feel about that. 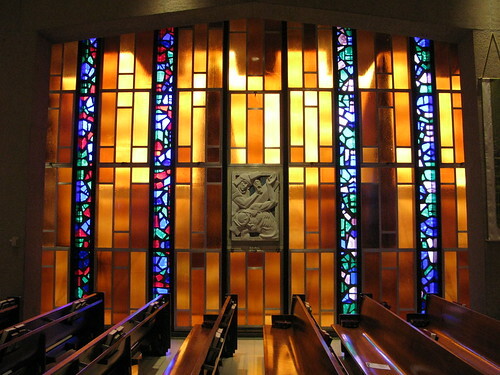 We made our way downstairs to see the Catholic chapel as well, this is a much smaller space but the walls were nearly entirely stained glass and gave the impression that the ceiling was floating. It is a pretty interesting room. I didn’t know that there were two more rooms downstairs otherwise I would have looked at them as well. The Chapel apparently has a Jewish room and an “all faiths” room. From there we headed to Pikes Peak. Of course I have been there a billion times, but Melanie had never been on top of this mountain and of course, with all my jibber jabber about the race and the road, well she kinda had to see it in real life to get an idea of what all the fuss was about. So we ascended the road and stopped at a few lookouts to enjoy the scenery. The day was beautiful and the weather couldn’t have been nicer! We spent some time at the top of the mountain before heading back down and took a nice panorama from the top as well! Afterward we rushed back to get dinner with friends and then not watch fireworks because the rain had eliminated them as a possibility. It was a fun day though and it made me excited to see more architecture! I only brought my G9 with me on this adventure. I didn’t want to stick out to much with a huge camera taking pictures at the church!